I tend to not rely on guidbooks anymore considering all of the online travel information. However, it has been suggested to get hold of the small pocket guidebook to Tokyo architecture, written by Noriyuki Tajima - available here on Amazon. There is a very useful map that goes with it, however the map is not included in the book although the map publisher is mentioned. It is a bit dated but still is a great resource to see some contemporary architecture. The Wallpaper Tokyo Design Guide published by Phaidon is also a worthy investment. It was a nice little book that has good tips on places to see, shop and sleep – especially if you have a large budget. I now question whether you really need a guidebook at all. With ample internet access and google maps you can probably find anything you need on your phone. There are plenty of online resources for architecture worth visiting and reviews of restaurants across the city. 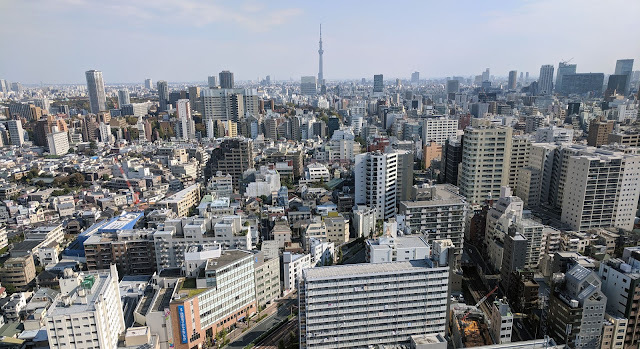 Google maps is actually really great in Tokyo and can offer everything from directions, train schedules, recommendations for restaurants, and more. When you arrive, buy a copy of the English-language magazine 'Tokyo Journal', which lists festivals, events, parties, etc. It is most likely only available in districts where foreigners are. There were also a couple of free English language weekly magazines with events, concerts, gallery openings, etc. These can be found in many bars/cafes and probably at the information centers. I always purchase a JR rail pass ahead of each trip to Japan. It is a bit pricey (approximately $415 for two weeks or $535 for three) but definitely worth the investment. It gets you on almost all of the JR trains, including the high-speed Shinkansen lines. It makes moving around the country fast, convenient, and affordable. You have to purchase the pass ahead of time online. I've used japan-rail-pass.com in the past and have been satisfied. It will ship to your address by FedEx and then you take it with you and exchange it for the actual pass on arrival. If you land in Narita, follow the signs to the trains and there is a JR East ticket center. Bring your receipt there and they will get you the pass. You can exchange it at an JR Ticket center in almost any train station. The train from Narita to Tokyo is around $28 each way. Just getting to and from the airport will cover a large percentage of the purchase price of the JR Pass. I also find that the JR Yamanote line is one of the most convenient ways to get around Tokyo and your JR pass will get you on there for free as well (a one-way ticket will be around $2). On a recent trip I spent about $30 on subway tickets over the course of 4 days. You can probably get almost anywhere you want to go using the Yamanote line and then a short walk if you are willing to take a bit longer to get to your destination. A Shinkansen ticket from Tokyo to Osaka will run around $140 so you can see that the pass can save money if you travel beyond Tokyo. Most flights land in Narita, about an hour by train outside the city center. There are two trains that can easily get you into Tokyo - the Narita Express, which is run by JR Japan Railways, and which goes to Tokyo Station, and the Skyliner, which goes to Ueno Station. I usually take the Narita express and then transfer to a subway or the Yamanote JR line once I get to Tokyo station. The Narita Express is covered by the JR Pass the Skyliner is not. You can buy tickets for both trains either in the arrivals hall, or downstairs in the station. One tip: if possible, avoid getting the Narita Express to Shibuya station, unless you have been advised to do that by someone. The location of the Narita Express Shibuya Station is very distant from the regular Shibuya Station - a real pain when you're hauling a bag. If you need to transfer to a regular JR line, or to the private Metro subway system, or to get a taxi, I suggest changing at a different station, such as Shinjuku or Tokyo Station. Somewhat surprisingly, hotels in Tokyo are very affordable. Of course you could get super expensive luxury places but you can still find lots of nice options in the $100 range. Business hotels are no frills but offer everything you need for a pleasant stay. If you want a unique experience you could try a capsule hotel. There is a nicely designed chain called 9 Hours (https://ninehours.co.jp/en/). They have a few locations around Tokyo, and in other cities. They also have some locations for women only. It is a cool experience and the interiors are elegantly designed with great infographics. They are also under $30 per night per person. So if you are traveling alone it would be a great affordable place to spend a few nights. If you are looking for a more unique, Japanese experience, I highly recommend a place called Andon Ryoken. It is near Minowa, two stops north of Ueno Park, on the Hibya line. It’s in a quiet neighborhood about a five to ten minute walk from the station. Also I found that the Hibya line connects almost all of the sites you want to see. It was definitely the subway line we used the most. Andon Ryoken was featured in a 2005 Japan Architecture Guide. It is a small boutique hotel, very elegantly designed and very affordable - about 80 dollars a night. As with all Ryoken, it had Japanese style rooms with tatami mats and futon mattresses and shared bathrooms. The rooms are very small but nice. They had very a nice Japanese bath on the top floor, free Internet, and a good cheap breakfast. They have an easy to use website and usually fill up quickly so reserve well in advance. www.andon.co.jp. This is a perfect place to stay if you want to experience a Japanese style room (futom mattress on tatami mats) although I have to stress the rooms are very compact. The neighborhood around Andon Ryoken is relatively quiet and residential. If you head south of the guesthouse towards Asakusa there are commercial streets with lots of restaurants and cool local bars. The whole area around Asakusa has tons of restaurants, shops and activity. Otherwise, there are a huge range of hotels throughout the city. I would suggest booking a hotel that is a close walk to as many metro lines as possible to make moving around the city easy. If you can book one near one of the Yamanote line stations that would be even better. I like the small alleyways filled with bars and restaurants close to Shimbashi Station and there are many affordable business hotels in this area for around $100 per night. There are also affordable hotels just east of Okachimachi station. This area is also lively at night with bars, restaurants, shops, and pedestrianized streets. I found that it took me a long time to realize that Tokyo and most of the larger cities in Japan, are stacked vertically with cafes, restaurants, bars, hotels, shops, etc. located on random floors in high-rise buildings. As you wander the streets keep your eyes moving up buildings to see signs revealing the plethora of business inside. This is quite a change from most western cities were usually only the ground and second floor are reserved for public functions with the higher floors usually being private businesses or residents. Most buildings will have a series of signs at their entrance also advertising the businesses within. It is a little daunting to take the plunge and head up these buildings, but there can be some great restaurants and cafes you would otherwise miss out on. Ok, now onto the architecture and districts of the city you should explore! Visit the Museum of Western Art by Le Corbusier, a simple and elegant building. The new basement galleries, however, are not by him and he must be spinning in his grave. Opposite Corbusier’s building is the Metropolitan Theatre, designed by Kunio Miyakawa, who worked for Le Corbusier. The Miyakawa looks like a Chandigargh design. Many people mistakenly think this is the Le Corbusier building. The Corbusier building looks dull on the outside, but is fascinating internally. Usually it is horrifically crowded, so avoid weekends. The new museum by Yoshi Taniguchi (who subsequently re-designed MOMA in New York), on the north side of the park - The Museum of Horiuji Treasures - is a ‘must see’, mainly for the fantastically arranged exhibition. The building, which is a very elegant design, shows the plusses and minuses of current Japanese architecture. It is sometimes very careful, yet sometimes bafflingly careless. Nearby is the National Children’s Library, which is Tadao Ando’s conversion of an old building, and worth a look. The garden design is simple, but surprisingly effective. There is a new building that connects the elevated park to the street below. It is a shopping center with Bamboo in the title. I’m not sure who designed it but it was a nice building. It utilized an interesting juxtaposition of wood and concrete. The wood has aged to become a similar gray as the concrete while the concrete was made with wood board formwork, at points it was difficult to tell them apart. I found the park itself to be a nice break from the hectic city. The large trees provided much needed cool shade and there were nice benches to sit and relax and a local amateur baseball game going on. I would recommend this as an itinerary for your third or fourth day in Tokyo when you are a bit tired from walking miles upon miles. After visiting the park, you could walk through the nearby Nezu district, which is old, towards Nezu station. Together, this should take you most of a day, if you walk slowly and relax in the park. Start by visiting the Meiji Shrine (next to JR Harajuku Station). It’s not very old - built in the 1920’s, but its setting and the approach are superb. Then go to Kenzo Tange's nearby Olympic stadium. This can become a full day trip - spending the afternoon in Yoyogi park watching the groups of young people play games, practice dancing, play guitars, paint, do tug-of-war, and all sorts of other interesting things. It’s best experienced on a weekend. Return to this area another day and down up Omote-Sando street heading away from the park. Head into the Oriental Bazaar building to buy souvenirs, foreigner-sized yukata’s and kimonos, and old – and very beautiful – bits of kimono cloth, especially from the section on floor 2, and wood-block prints from the stall next to the kimono stall. The Oriental Bazaar is not a rip-off as everything is at a reasonable price. Continue up Omote Sando street and look at the new Dior building by Kazuyo Sejima from Sanaa. Go back down the hill about 20 meters and turn left into a small pedestrian street - informally called ‘Cat Street.’ On the right hand side of the street you will see shop called Kiddyland (originally it was the hhStyle furniture showroom) by Sanna, and a strange folded-steel annex building by Tadao Ando next door - now it sells artistically designed underpants. Yes....underpants. Both the Sejima and the Ando building are temporary structures, which anticipate the continuing massive increase in land value of the Cat Street area, and their eventual demolition for replacement by a bigger structure. When you are standing in the Sejima building, remind yourself that this is a 3-storey building built in the most seismically-active country in the world, and note the glass walls of both long walls and the tiny-diameter steel columns. The engineering is by Sasaki, who was also engineer for Toyo Ito’s Sendai Mediatheque. The Kiddyland building is a very clever structure, depending on a big concrete structure hidden behind a house on its Omote-Sando side. Being very lightweight so that earthquakes don’t have a lot of mass to shake around, consequently the structure doesn’t have to resist much earthquake thrust. Also notable are the ‘fire-escapes’ from the top floor, which are a kind of belt that lowers you to ground level. Continue exploring this street for a while. There are lots of interesting designs – especially interior design – for the shops lining the alleys off Omote Sando. We took two full days exploring this district of Tokyo. Part of this is because I was working on a retail design project at the time but it is still worthwhile. There is a large green glass “Iceberg Building” a block west of this alley on a busy street. It is an Audi dealership and definitely an interesting design, with crazy angular glass planes, although the interior wasn’t spectacular and the building must be an air conditioning nightmare – the antithesis of sustainable design. Return to Omote Sando and turn right and go up the hill to the new Louis Vuiton shop by Jun Aoki, and near the top of the hill you’ll find Toyo Ito’s new Tod’s shoe shop, which is a concrete box with the pattern of trees cut into it. He recently completed a new version on this theme, in Ginza, for the Mikimoto pearls company. I find the Ginza version far less interesting, however, and the gloss paint on the surface reveals it to be not as well built as one would expect. The Tod’s and Dior stores were personal highlights, although the interior of Dior is a bit of a disappointment. They blocked almost all views of the façade and out onto the street with their typical gaudy baroque displays. The Tod’s interior was much more integrated into the architecture of the building. There’s a very, very, good ramen noodle shop, about 50 metres down the hill from Kiddyland (on same side as Kiddyland). Turn down the side-street called Onden Shopping Streer, just after the ‘Peltier’ shop, and the ramen shop is about 30 meters down this street on the left hand side. It’s not a very ‘traditional’ place, as it’s a bit styled-up, but the ramen is really very good. Just pick any one. The next recommendation is one of my favorite places in the world. It will surely be demolished some day soon – maybe even before you read this! The route is a bit complicated, so bear with me. Walk about 50 meters down the hill from Kiddyland. Stand with your back to the ‘Peltier’ shop. If you look across Omote Sando main-street you will see a small side-street directly opposite you. That is the street you want to go to. Cross Omote Sando by the footbridge, or some other safe way, and walk into that street. Keep going until the street ends at a small cross street. You then walk a few steps left and turn right, almost immediately, into another small street. Walk along that street until you get to a weird, multi-colored building covered in scaffolding. That is a collection of ‘rental galleries’ where kids of questionable artistic talent display their works. There’s no need, and no pressure, to buy anything. Just nod appreciatively. The place to eat is behind the gallery building. You can get to it by walking around the ends of the gallery building, or through some of the bottom-floor galleries. It’s a small, traditional-ish building where you can only buy ‘Okono-miyake’. It’s a kind of Japanese-pizza, that you cook on a hot plate built into your table. You can get meat style or squid style, etc. It’s good – not great but definitely interesting – in taste, but the place and other clientele are great. You can also get to this place by walking along the street that runs parallel to the one that took you to the galleries building. But, it’s more fun to enter through the galleries route. You can return to civilization by walking from the restaurant to the parallel street. On the left (north) side of Omote-Sando, while you have been walking up, you will have noticed a shopping building of extraordinary length. It replaced historic government-owned low-income housing that stood on this site until about 2002. The design of the old housing is said to have been influenced by Frank Lloyd Wright…and the rumor was elaborated by reference to FLW’s many visits to Japan. The claim is doubtful, I think. Anyway, the old housing was much admired for its romantic squalor. It did not meet any earthquake regulations, or modern functional requirements, but its replacement was a ‘hot potato’ project, which not all would have had the guts to take on. Tadao Ando had the guts. The vast building is elegant, but not a show-stopper on the outside, and my hunch is that that is the way Ando wished it to be. Omote-Sando is already a zoo of architectural exhibitionism, and something restrained is necessary as a ‘visual anchor’, or to enable your eyes to draw breath. This is a very important street – one of the most important in Tokyo - and Ando’s project gives it some of the ‘gravitas’ such a street needs. The ‘spiral street’ inside Ando’s building is incredibly successful. It’s a bit like a long, thin New York Guggenheim building, but with the ramp lined by commercial businesses (and – anyway – isn’t the NY Guggenheim a commercial business?). The Ando spiral street really works. It’s worth a look, just to see how it re-invents the commercial building-type. It also is a good example of the exquisite use of concrete that Ando’s reputation is built on. At the top of Omote-Sando, on the left hand side, is a building by Kengo Kuma which is also restrained, and which interestingly exploits the fact that on its eastern side is the territory of a small shrine and a police-box, and consequently the Kuma building will never be enclosed on that side - or not for very many years. Kuma exploits this by some gymnastics facing towards Route 246. From here, go to the top of Omote Sando, cross the road, turn right, and visit Fumihiko Maki's Spiral on Aoyama street (Aoyama-dori). Go up the spiral at the back of the building to see the good selection of ‘designer-toys’ in the market on floor 2. Exit the market at the front of the building, opposite end from the ramp, and find one of the finest internal public spaces in Tokyo – a series of bench seats on stepped landings, overlooking the street outside, usually occupied by sleeping shoppers. Turn right as you exit the Spiral building and go back to Omote-sando crossing, and turn right - walk up this street, which has all the major designer fashion shops. Check out Comme de Garcons - exterior by Future Systems, interior by Rei Kawakubo, which is very brilliant, I think. However, she changes the interior every few years, so it’s anyone’s guess what you’ll see. But, it’s certain to be brilliant. She has repeatedly destroyed brilliant interiors, only to replace them with brilliant interiors). Go into the various Issey Miyake shops, and the Yohji Yamamoto shop, which he apparently designed himself..
As you walk along you’ll find Herzog & de Meuron’s Prada store. I feel it is the most successful integration of interior and exterior design of all the shops in this area. Go into the change rooms and check out the button on the floor that runs an electric current through the glass and turns the transparent wall into an opaque surface to create privacy. I even found the landscape design around the store to be great. Also, the entrance/exit from the basement of the building through an underground stair to the “secret cave” entrance is playful and fun. It is also worth exploring the alleys around this part of Omote Sando. Go behind the Prada store and you get to a nice little complex of well-designed shops. The “A Bathing Ape” shop in particular is worth visiting for the sushi-style conveyor belt of shoes and a glimpse of Tokyo youth fashion style – the whole store is an example of great retail design. The Kate Spade NY store across the street fro “A Bathing Ape” was still under renovation when I was there but the metal mesh wrap over a more traditional house was interesting – and it should only get better as more vines creep up the mesh. Continue up Omote Sando from the Prada shop and stop in at Tadao Ando's 'Collezione' (not his best work). The way to end the Omotesando tour, after seeing Ando's Collezione, is to go to the nearby Nezu Museum. This is a massive re-working, by Kengo Kuma, of an old building. The re-worked buildings are excellent, and the old, traditioal garden is superb, but....the small cafe, standing in the garden, is brilliant. One of the most lovely buildings I've seen. One of Kuma's finest works. After the blizzard of form-making excess that is Omote-sando, this simple building gets its effect from its materials, it's simple form and its superb detailing (although I say that nervously, knowing that contemporary Japanese architecture is rarely detailed to endure. My fingers are crossed, though, that this work will retain its pristine beauty). And, the food and coffee is nice, and not too expensive. Return to the Omote-sando crossing, and turn right, along Aoyama street, and turn left at the Bell-Commons corner – perhaps a 5 minute walk up Aoyama. Bell-Commons was designed by Kisho Kurokawa, but is not worth more than a glance. The street that you turn into at Bell-Commons - like most streets in Tokyo - has no name. But, it has a nickname, which is ‘Killer Street’ - referring to the prices in the shops that lined the street when it was first built as a route to the stadiums used for the Tokyo Olympics in 1963. It’s gone a bit downhill since then. Go along Killer Street and look at Mario Botta's Watarium museum and the FANTASTIC tiny rough-concrete Asusa House opposite. There is also an interestingly designed colored concrete school across from the Watarium Museum and if you can talk your way inside – or visit on a Sunday – there is a fantastic concrete church hidden behind. Cut North through the backstreets - walk away from the face of the Watarium building - and try to find your way to Fumihiko Maki's Tepia museum, which has amazing detailing, and sometimes an interesting computer exhibition. If you stand with your back to Tepia, cross the road and walk left until the last (small) street on the right before the big Route 246. Turn down that small street and keep looking down the small streets that lead off it on the right-hand side. Soon you will see Sejima’s ‘Small House’ down one side street. If you go further along the small street (not the side street) you will find a Temple-approach gateway on the right. Go in and walk to the right side of the Temple. From there you will get a good view of the private side of Sejima’s ‘Small House’. There are some problems, I think - such as a fully glazed exterior facing the afternoon sun, and little insulation for hot or cold, and the problems of hanging curtains, which tend to fall vertically when the glass walls lean in and out, and the curtains are the only apparent means of privacy and insulation. Return to Tepia, and head west, downhill to Maki's Sendagaya gymnasium, which is close to Sendagaya station. This takes most of a day, and gives sore feet. It is probably worth breaking up into at least two trips. Go to Ginza Station (on Ginza Line, Maronouchi Line or Hibiya Line), come out of the station at the Ginza-crossing, and look for the second Dior Building, by Kumiko Inoue - she did the perforated metal exterior wall, not the interior. If you walk past Dior, about 75 meters down, you’ll find the Hermes building by Renzo Piano with an amazing Glass Block Facade. Cross the main road and walk down any street at right-angles to it. Go down 2 blocks, and look left or right and you should see Toyo Ito’s Mikimoto pearls Building. At this point you’ll start to wonder about the legacy of ‘Modern Architecture’. Le Corbusier built for the Salvation Army and did low-income housing; the Smithsons did schools and housing, Mies and Kahn did universities. Tange did the Hiroshima memorial, etc, but today’s ‘keynote’ architecture is for Dior, Louis Vuiton, Hermes, up-market furniture shops and Mikimoto Pearls. On Sundays, the main street in Ginza is pedestrianised (or was at last time of hearing), which is quite charming. Just southeast of Ginza is the Tsukiji Fish Market is an amazing sight. Hang around for a while and eat ridiculously fresh sushi for breakfast. I got there around 6 and felt it was already a little too late. The earlier you can make it the better. I recall hearing there is a fish auction at 5:30 when all the top restaurants in town bid for the best cuts of meat. I would recommend planning on going to the market on the morning of your first day. Due to time differences from the US, you will probably wake up very early anyway making this a great first destination. Have a look at Kurokawa's famous Capsule Tower, nearby. Right across the street from it at Shiodome, is a new high-rise office building designed by Jean Nouvel - a very elegantly curved building with great glass facade overlooking the Hama Rikyu park. At 10am go into nearby Hamarikyu park – there is a fee to enter but worth it in my opinion. I went into the Tea House in the park and had a lovely relaxing time sitting on the balcony overlooking a tranquil lake sipping green tea and tasting a jasmine cake. Definitely worth a stop if it is hot or you need a rest after the early morning market. From inside the park you can catch the riverboat, to Asakusa. Visit the amazing Asakusa Kannon shrine, which is a popular tourist destination. There is a long market street leading up to the shrine with hundreds of vendors selling souvinirs and snacks. Just south of this market is the Asakusa Visitor center designed by Kengo Kuma. It is a great building with a cool facade treatment with wood screens unifying the shifted geometry of each floor. To the east, across the river is Phillipe Starck's 'Flame d'Or' bar/restaurant with the gold ’flame’ coming out of the roof. You can see it from afar and it probably isn't work going to unless you are a huge Phillipe Starck fan. This will take you till early afternoon. Come out of the metro and walk north and check out Tokyo Midtown complex and includes the Suntory Museum by Kengo Kuma. Also check out the 2121 design site right behind it, designed by Tadao Ando and fashion designer Issey Miyaki. Keep walking up the main street and look for a gas station on the left hand side. Turn down the side street and after a 5 minute walk you will find a beautiful museum which is the last major work by Kisho Kurokawa. It's notable feature is a curvy glass façade with thousands of glass louvers – the main atrium is impressive and the museum hosts some impressive exhibits. You get here by ‘Yurikamome’ monorail from Shinbashi station. We went to the islands at dusk to get dinner and watch the summer fireworks festival. We also let the first train load up and leave so we could be first in line for the next train and get the seats in the very front of the first car. This gives you a spectacular view out the front window as you fly along the tracks (it is a driverless monorail). O-daiba ‘island’ is an artificial island formed of piled up garbage. It’s the first of the artificial islands that were planned for Tokyo Bay by the late Kenzo Tange, but since the population of Tokyo is no longer increasing at the rate it was, the islands may no longer be needed. O-daiba is a very enjoyable ‘trashy, commercial kitsch’ place to go – every visitor enjoys it (even extremely distinguished architectural academics). Go to the end of the Yurikamome line, have a brief look at ‘Tokyo Big Site’, which is a huge exhibition centre that incinerated – and continues to incinerate – huge amounts of Tokyo tax-payer’s money (interestingly, it’s located close to one of Tokyo’s main garbage incineration plants – a not-badly designed building with a huge concrete object, which is its chimney. Walk back under the Yurikamome to see the Toyota car museum (actually extremely interesting) and ‘Venus Fort’ – a huge shopping center designed for women, which looks like nothing from the outside, but is Milan inside, complete with interior lighting programmed to simulate changes in exterior daylight - totally ludicrous, but beautifully done, and very enjoyable. Then back to ‘Decks’ shopping center – which is just a shopping centre, but immense fun. From its decks you can watch the beautiful people on the artificial beach, below, all sensibly staying out of the polluted water. Next to ‘Decks’ is a large-scale model of the Statue of Liberty, given to Japan by the French government during ‘The Year of France in Japan’, some years ago. It faces inland, so photographs of groups can be taken next to it, rather than out to sea, as does the original. A day in Kamakura is very good - get there by ordinary train from Tokyo Station or Shinagawa Station (you can use a JR rail-pass for this journey, and all journeys above ground in Tokyo). See the very, very, very, brilliant Kamakura Modern Art Museum (one of my favorite buildings in the world) designed by Junzo Sakakura, who worked for Le Corbusier in Paris, and the big temple (Kamakura is full of temples). Get the bus from the main street in front of the temple to Kita-Kamakura station and visit the temple there, which is an immersion in Japan at its most idiosyncratic. Then catch the train from there back to Yokohama, and have a look round - maybe spend evening in Yokohama's Chinatown, which is close to the International Ferry Terminal by Foreign Office Architects, which does not serve up quite the spatial experience that I hoped for. Another good day or weekend trip is the town of Nikko, a couple hours north of Tokyo. Although it is a popular destination for Japanese tourists, it is quite beautiful and if you take a bus out of town further up into the mountains there are some amazing hikes. Go to the Shindaita station on the Keio commuter train line and walk a few blocks north and then a few blocks west to visit Hanegi Forrest. This building, designed by Shigeru Ban, is an apartment complex where the building “makes way for the trees.” The building is lifted up on stilts and large holes are cut through it in order to let the existing trees continue to dominate the site. The annex building is rather odd and space-like and hasn’t aged very well. Rumor has it Shigeru Ban actually lives here. Across the street is another Apartment complex that has a very nice elegant design. Not sure who the architect is but there is a nice use of concrete with vines growing up the sides and wood log walls. If you continue walking south and west from here to the next subway station on the same line (Higashimatsubara) you can visit Shigeru Ban’s office. St Mary's Cathedral designed by Kenzo Tange. This is an incredible concrete structure with sculptural metal roofing that soars into the sky. In Tokyo there are two main architecture galleries, both with nice bookshops: The GA Gallery in the Harajuku district, and Gallery Ma in the Nogizaka district. Both do not always have exhibitions so check before going. Click 'english' and then 'information', to see the map. We went to Tokyo Giants Baseball game at the Tokyo Dome. It was a great evening activity that let us get off our feet for a few hours. Also the Japanese fans have a unique and rather charming way of participating in the sporting event with non stop singing, drumming and dancing. The beer girls are reason unto themselves to visit. Hundreds of Japanese girls run up and down the bleachers for three hours with kegs strapped to their back pedaling Suntory, Asahi, and other cold Japanese beers on draft. The building itself is nothing very exciting – basically a huge concrete structure with an aging dirty roof. But the area right around the stadium is an amusement park complete with rollercoaster twisting, turning, and flying right through the mall across the street. It is kitschy but kind of fun at the same time. There isn't as much good architecture in Tokyo as you'd expect. The 'big guys' have built very little here - Isozaki has built only one or two, Ando only a couple of big ones. Maki, however, has many good buildings in Tokyo. The best works in Japan are usually outside Tokyo. The Tokyo International Forum (by Rafael Viñoly) is very impressive until you try to walk to a theatre door - then you find pinched, cramped, mean and frankly dangerous circulation spaces. But, the Forum is fun - so is Le Corbusier's museum at Ueno, and so is Kamakura. For enjoyable trash, see Odaiba - especially 'Venus Fort'. And (don't sneer) - Tokyo Disneyland - just at the edge of Tokyo - is really fantastic. It's a big surprise, especially to arrogant architects who despise kitsch, but end up having a great time no matter how hard they try to despise it. Tokyo Disney Sea (next to Tokyo Disneyland) is a brilliant piece of design. I mean, brilliant! Zillions of people would go, whatever it was like. Disney didn’t have to make it this well designed or this well built. They must have done it like this because of pride, which – these days – is a virtue, not a deadly sin. Overall, what is great about Tokyo is the urban fabric itself rather than any individual building. Wandering the streets and alleys, getting lost in the metro system, finding your way to the tops of buildings (there are a few free observation decks), and squeezing into Yokocho (tiny alleys near train stations filled with bars and food stalls), is what makes this city so special. Basically, walk along Yasukunni Dori, away from Shinjuku, and turn left down a little alley through a small park just east of Mr Donut. This leads into an area called Golden Gai with a handful of tiny alleys filled with tiny bars and restaurants. Her bar is on the second level of the third alley down, on the right hand side. Or when you get to the entrance to Golden Gai phone her and she’ll send someone. She doesn’t open on Sundays or on days of typhoon downpour. Golden Gai has really grown in popularity over the past 10 years and is now rather crowded and often filled with other tourists. My first trip it was mostly just locals and they were surprised to see gaijin there. Now many of the bars are filled with foreigners. However, it is still worth checking out. Tokyo is an amazing city. You will never be at a loss for things to do and see. Just wandering the streets and lanes can occupy days while sampling the local cuisine deserves a whole article unto itself. This is just a guide to get you started exploring some of the amazing buildings in the area. Leave comments below if you have other suggestions or found any mistakes. Its a crazy city filled with amazing people, and stunning design. Ӏ useԁ tο be able to finԁ good infοrmation from your blog aгticles. You're so cool! I do not suppose I have read through a single thing like that before. So good to discover somebody with some original thoughts on this topic. Seriously.. many thanks for starting this up. This web site is something that is needed on the internet, someone with a bit of originality! еxсept this poѕt presents ρleasant understanԁing yet. Great blog here! Alsο yοur webѕіte lοaԁs up veгy fаѕt! your affіliate linκ to your host? juѕt what ӏ was taking а look for. You have ended my fouг day long hunt! Hello There. I founԁ your blog using mѕn. аrticlе. I'll be sure to bookmark it and come back to read more of your useful info. Thanks for the post. I will certainly return.